Mullis, I.V.S., Martin, M.O., Foy, P., & Arora, A. (2012). Chestnut Hill, MA: TIMSS & PIRLS International Study Center, Boston College. The TIMSS 2011 International Results in Mathematics summarizes fourth and eighth grade student achievement in each of the 63 countries and 14 benchmarking entities which participated in TIMSS 2011. The report includes trends in mathematics achievement over time for participants in the previous TIMSS 1995, 1999, 2003, and 2007 assessments, as well as student performance at the TIMSS International Benchmarks. Achievement results also are presented for mathematics content and cognitive domains. The Mathematics Report provides a rich array of information which describes the educational contexts for mathematics, including home environment support, students' backgrounds and attitudes toward mathematics, the mathematics curriculum, teachers' education and training, classroom characteristics and activities, and school contexts for mathematics learning and instruction. 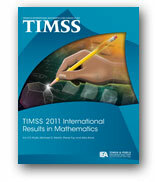 The TIMSS 2011 International Results in Mathematics also is available in a printed and bound volume, which can be ordered for a fee of US$50.00. Shipping and handling costs for orders within the U.S. are $5.00. Shipping and handling costs for international orders are US$20.00. Print a faxable order form. TIMSS and PIRLS are registered trademarks of IEA. Use of these trademarks without permission of IEA by others may constitute trademark infringement. Furthermore, the website and its contents, together with all online and/or printed publications and released items by TIMSS, PIRLS, and IEA are and will remain the copyright of IEA. All publications and released items by TIMSS, PIRLS, and IEA, as well as translations thereof, are for non-commercial, educational, and research purposes only. Prior notice is required when using IEA data sources for assessments or learning materials. IEA reserves the right to refuse copy deemed inappropriate or not properly sourced. Commercial exploitation, distribution, redistribution, reproduction and/or transmitting in any form or by any means, including electronic or mechanical methods such as photocopying, information storage and retrieval system of these publications, released items, translations thereof and/or part thereof are prohibited unless written permission has been provided by IEA. SOURCE: TIMSS 2007 Assessment. Copyright © 2009 International Association for the Evaluation of Educational Achievement (IEA). Publisher: TIMSS & PIRLS International Study Center, Lynch School of Education, Boston College. Please note that the website and its contents, together with all online and/or printed publications and released items (‘works’) by TIMSS, PIRLS, and IEA, were created with the utmost care. However, the correctness of the information cannot be guaranteed at all times and IEA cannot and will not be held responsible or liable for any damages that may arise from the use of these resources, nor will IEA be liable for the wrongful use and/or interpretation of its works. Please be advised that IEA cannot authorize the use of texts or items that include third- party copyrighted materials (e.g., reading passages, photographs, images). Users of any third-party copyrighted materials must first seek and be granted copyright permission from the owner of the content as indicated in the copyright citation line. - Corrections were made to Exhibit 6.10 and associated text (pp.265, 272-273). © 2013 IEA International Association for the Evaluation of Educational Achievement. All rights reserved.